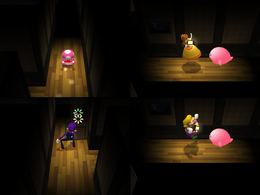 Ghost in the Hall is a 4-player minigame in Mario Party 7. The game name is possibly a pun on the 1989 manga Ghost in the Shell. The game starts out with the first player walking through the rain into a haunted mansion. Players must choose certain pathways to get to the exit. Some pathways contain Red Boos that scare the character and make them go in the opposite direction; others contain doors that will open and stun the character. The first one to the exit (which will be a wide pathway with a red carpet) wins. The rain stops as the winner walks out of the mansion and does their victory animation. Rules – "Aaaah! A haunted house! Run for the exit and get out before everyone else." Advice – "Closed doors will slow your progress, while Red Boos will stun you. Watch out!" Nukedase! Obake yashiki Escape the Ghost House! Even if the player picks Boo as the character, he still gets scared by the Red Boos. This page was last edited on December 14, 2018, at 22:58.